MIDORI SECRET ENERGY POWER TONIC 120ML – HAIRDEPOT - Hair & Scalp Care Products, Prevent Hair Loss, Shampoo, Conditioner, Treatment, Styling, Appliances and more! 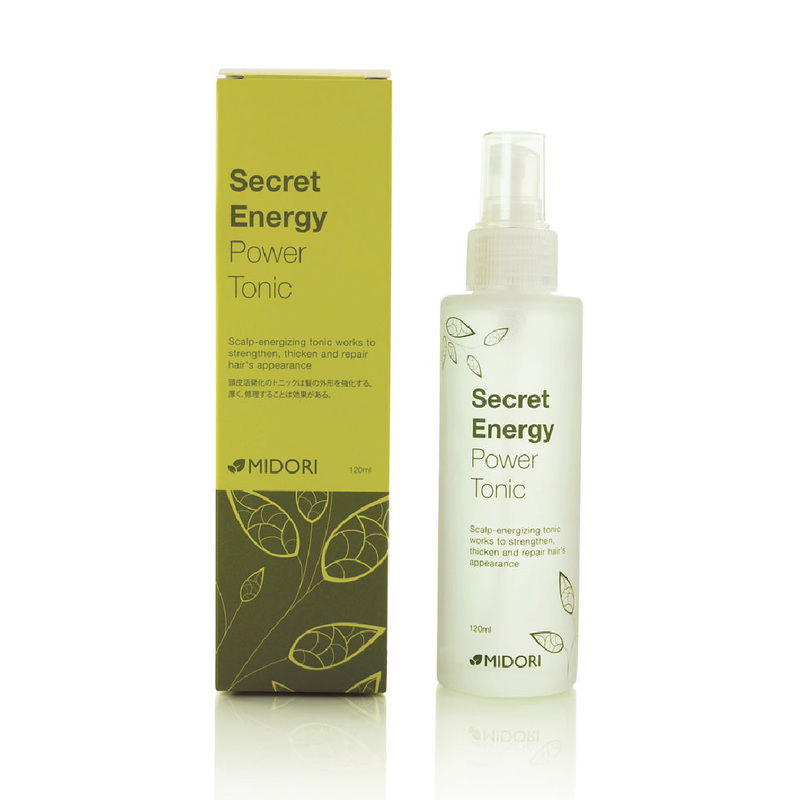 Midori Secret Energy Power Tonic has a proven formula, which eliminates tiresome dandruff, relieves skin itch, soothes irritation and prevents associated hair loss. Apply to shampooed and towel dried hair or fully dried hair. Spray tonic directly onto scalp. Gently massage in with the fingertips, rub in with a light circular massage for optimum absorption. Leave on for a 3-5 minutes and styles as usual. DO NOT RINSE. Recommended to use daily or after every hair wash.
Arnica Extract, Chili Oil, Onion, Ivy Extract, Witch0Hazel Extract, Menthol, Keratin Hydrolysate, Amino Acid. It contains natural ingredients that strengthen your scalp's natural defenses and prevents it from becoming oily prematurely, yet storing the moisture. Midori Secret Energy Power Tonic's exclusive multi-complex promotes circulation and prevents inflammation, creating the prerequisite for your healthy hair. Arnica Extract: To treat alopecia neurotic, an anxiety condition leading to hair loss. Ivy Extract: Effective for anti-dandruff and able to promote healthy hair & scalp. Witch-Hazel Extract: Help slow down the oil production of the sebaceous glands in your sclap. Keratin Hydrolysate: Strengthen hair and provide much needed nutrients.